Khova, the alternative names are Khoya, Koa, Kova, Maua, Khuwa and Khuaa. 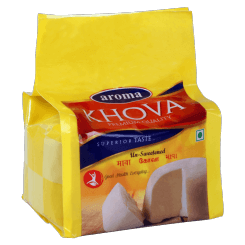 Khova is a dairy product widely used in the cuisine of the Indian Subcontinent, encompassing India, Nepal, Bangladesh and Pakistan. It is made of either dried whole milk or milk thickened by heating in an open iron pan. It is lower in moisture than typical fresh cheeses.